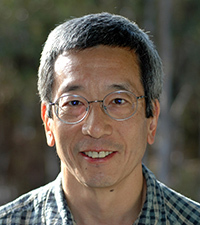 University of California, San Diego Professor Roger Tsien, Ph.D., will share the 2008 Nobel Prize in Chemistry with Osamu Shimomura of the Marine Biological Laboratory in Woods Hole and Boston University School of Medicine, and Martin Chalfie of Columbia University in New York. The scientists are being honored for the discovery of Green Fluorescent Protein (GFP) and seminal work to design and create fluorescent molecules that enter cells and light up their inner workings. 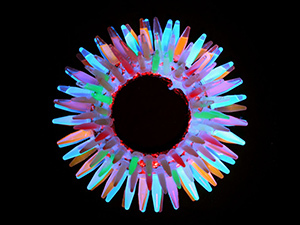 Watch a video on Tsien’s work. Visit the full website for Roger Tsien's Nobel Prize research. “Our work is often described as building and training molecular spies…molecules that will enter a cell or organism and report back to us what the conditions are, what’s going on with the biochemistry, while the cell is still alive,” said Tsien. In particular, his laboratory has engineered dyes that gently infiltrate their target, without disrupting or harming the cell, opening new windows into cellular function. Previously, dyes were injected, violating the cell membrane and limiting studies to larger cells. He and his collaborators also improved and modified Green Fluorescent Protein (GFP) from jellyfish and analogous red fluorescent proteins from corals to track a wide variety of cell signals. Tsien’s methods have led to new opportunities to monitor and image multiple molecular processes simultaneously, in all sizes and types of cells, without disrupting cell function. "I am delighted to join the entire UC San Diego community, including the hundreds of scientists and graduate students worldwide who have collaborated with him, in congratulating and saluting Roger Tsien for winning this year's Nobel Prize in chemistry," said UC San Diego Chancellor Marye Anne Fox. "Roger joins the extraordinary and prestigious ranks of Nobel Laureates at UC San Diego whose incredible scholarship is dedicated to improving the lives of people throughout the world." Tsien recently has set his sights on imaging and treating cancer, stating that “I’ve always wanted to do something clinically relevant in my career, if possible, and cancer is the ultimate challenge." He and his colleagues have devised new strategies to target imaging agents or chemotherapy drugs to tumors and are trying to translate these approaches to the clinic. “Dr. Tsien’s work has, and will continue to have, an enormous impact on human health by enabling researchers to study cells related to disease in detailed ways that had never before been possible,” said David Brenner, M.D., Vice Chancellor for Health Sciences and Dean, UCSD School of Medicine. A petri dish marked with Green Fluorescent Protein (GFP). Tsien attended Harvard College on a National Merit Scholarship, graduating at age 20 with a degree in chemistry and physics. He received his doctorate degree at the University of Cambridge where he was a Marshall Scholar. As a graduate student at Cambridge, he developed molecules to track and control the levels of calcium inside cells, levels that play a major role in the regulation of nerve impulses, muscle contraction, and fertilization. After postdoctoral work at Cambridge, he moved to the University of California, Berkeley, where he rose to professor of physiology. He moved to UC San Diego in 1989. At UCSD, Tsien’s lab began improving and exploiting a green fluorescent protein from Aequorea victoria, a jellyfish that glows brightly in the dark. He and his collaborators also created variants of the protein with other colors. Introducing this molecule or its variants into a cell made it possible to follow all kinds of biochemical processes within living cells ‘in real time’ – they are literally made visible. "Tsien's imaginative and skillful use of chemistry to illuminate the machinery of living cells has revealed essential biological workings that were previously hidden from view," said Mark Thiemens, Ph.D., Dean of the Division of Physical Sciences at UC San Diego. 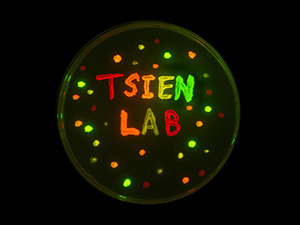 Tsien is a member of the Institute of Medicine, which advises the nation on improving health, the National Academy of Sciences, and the American Academy of Arts and Sciences. Among his many awards and recognitions, he also received the J. Allyn Taylor International Prize in Medicine from the Robarts Institute in London, Ontario (2005); was co-recipient of the Lewis S. Rosenstiel Award for Distinguished Work in Basic Medical Science in 2006; and was elected as a Foreign Member of the Royal Society of London in 2006. His research is funded by the National Institutes of Health, the Howard Hughes Medical Institute and a Department of Defense Breast Cancer Innovator Award. Past UC San Diego Nobel Prize winners include: Renato Dulbecco, 1975, physiology/medicine; Harry Markowitz, 1990, economics; Mario J. Molina, 1995, chemistry; Sydney Brenner, 2002, medicine; Clive W.J. Granger and Robert F. Engle, 2003, economics. The 2007 Nobel Peace Prize was awarded to former vice president Al Gore and the Intergovernmental Panel on Climate Change (IPCC), whose roster of researchers lists nearly two dozen Scripps Institution of Oceanography scientists including Mario Molina, Veerabhadran Ramanathan, Richard Somerville and Lynne Talley. Founded in 1960, the University of California, San Diego is ranked the 7th best public university in the nation by U.S. News and World Report and has been named the “hottest” institution to study science by Newsweek. UC San Diego is one of the nation’s most accomplished research universities, widely acknowledged for its local impact, national influence and global reach. Renowned for its collaborative, diverse and cross-disciplinary ethos that transcends traditional boundaries in science, arts and the humanities, the university attracts stellar faculty, students and staff. Learn more at www.ucsd.edu. Click here to view Roger Tsien's Nobel Prize webpage.